There are a few clouds in the sky, but most of the dullness in this view facing west from Beaufort is due to smoke. The northern Grampians area is under siege by a huge out of control bushfire. After 5 days of temperatures above 40 degrees, the cool change that’s on the way will be accompanied by extreme winds – they say up to 120kms per hour. 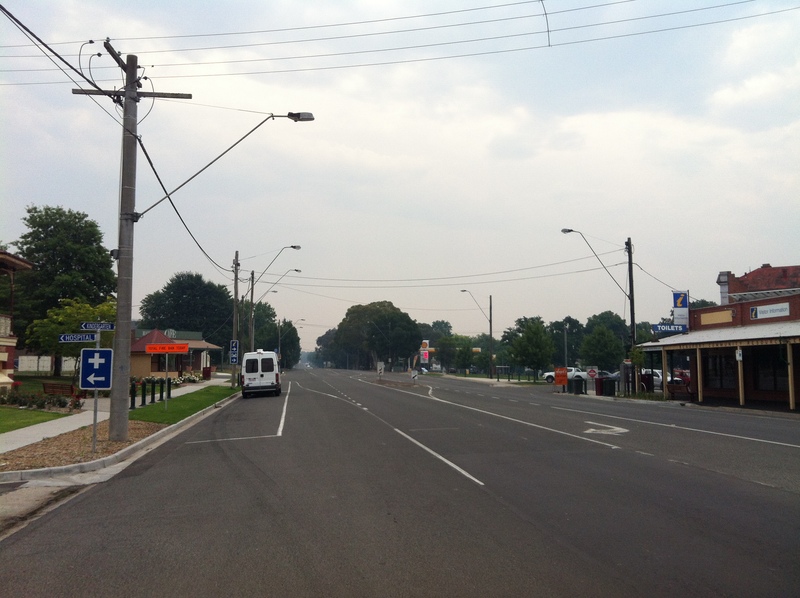 Multiple towns have been evacuated, including the tourist town of Halls Gap, which was expected to be hit around 7pm tonight, and even Pomonal 12km further east from the fire’s current location. One person is confirmed dead already – a body found in a burnt out house in Roses Gap, which was hit yesterday. You can see how dead my “lawn” is (weeds really). The countryside is even worse. Halls Gap is around 90km away by road. 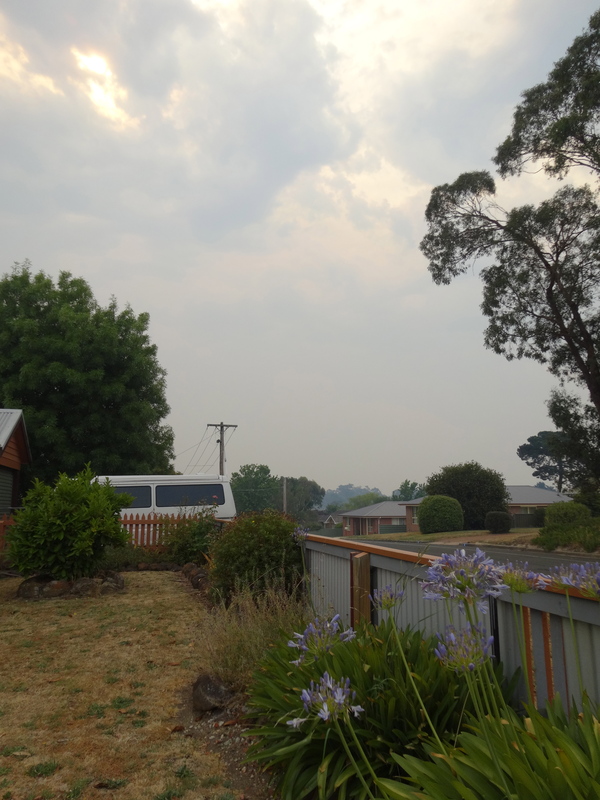 And yet the smoke here in Beaufort is so thick that outside it’s uncomfortable to breathe and I, for one, will be staying indoors for quite some time. And although it’s finally cooling down enough to consider opening doors and windows and turning off the air-con, I certainly won’t be doing that. Although I am at no direct risk from this fire, I am starting to gain some small understanding of the horror of the Black Saturday fire events that hit this state in February 2009, which I watched from the detachment and safety of coastal Western Australia. Having recently undertaken training through work in preparation for staffing an emergency relief centre here should the need arise, I am now on standby in case additional centres and staff are needed in Ararat or Stawell to assist with the relief effort for the Grampians fire. The most disturbing thing of all is that this will by no means be the end of it. Although we just had a short shower here 5 minutes ago – quite bizarre really – the long term forecast shows no hope of any decent rain for at least the next six weeks. So the bushfire risk is only going to increase. To be honest I don’t even know how safe or otherwise I am here in the centre of Beaufort township. This is such an alien landscape for me to understand. This is life in rural Australia. 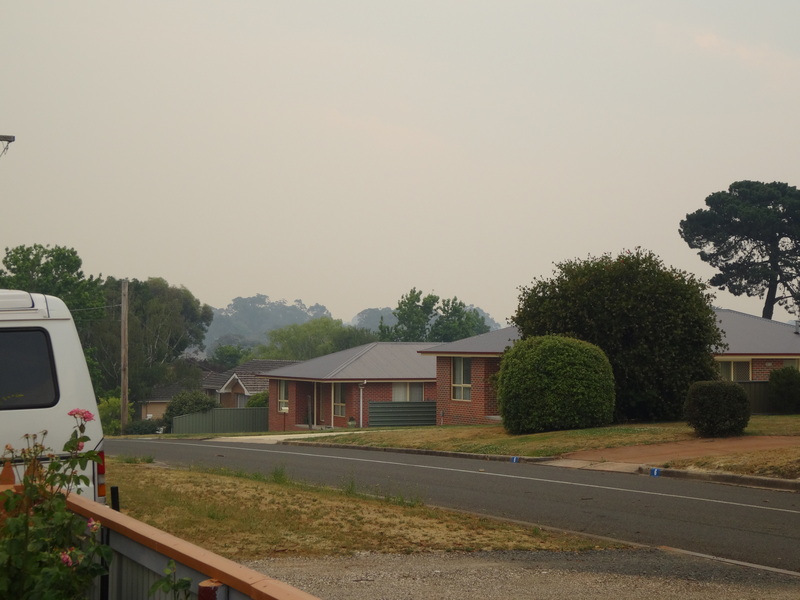 This entry was posted in Uncategorized and tagged Beaufort, bushfire, Grampians, Halls Gap, rural Victoria. Bookmark the permalink. Very worrying for you and the communities near you. Close friends have just lost their house and all their belongings in the Perth Hills fires.